Discussion in 'Price Drops, Must-Have Freebies, and Deals' started by macplash, Feb 2, 2015. 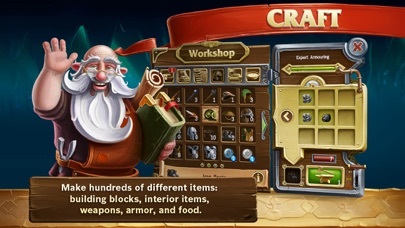 Are you going to buy Craft the World for iOS while on sale? Poll closed Feb 5, 2015. No, it's still too expensive. I already bought it on launch sale. 50% off for a limited time! 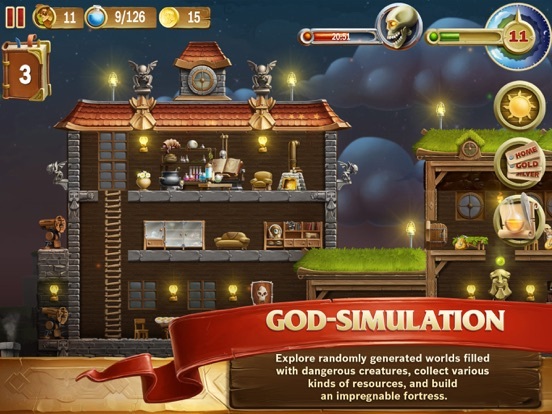 Craft The World is a unique sandbox strategy game, the mix of Dungeon Keeper, Terraria and Dwarf Fortress. Explore a random generated world populated by dangerous creatures, build a dwarf fortress, gather resources, and craft all the items, weapons, and armor you need. 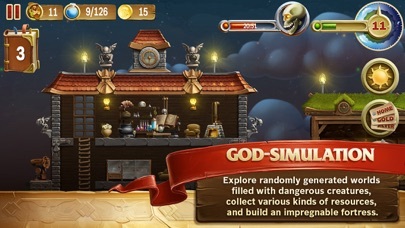 Pocket Edition contains all 4 worlds of the Steam version: http://store.steampowered.com/app/248390 GOD-SIMULATION You control a tribe of dwarves by giving them commands to dig in certain places, attack enemy creatures, and build houses and other structures. You'll need to provide your dwarves food and clothing, as well as help them with magic when fighting against other inhabitants of the world. You start the game with one dwarf and gain additional dwarves as your experience level increases. SANDBOX GAME Each game level has many layers of earth to explore, from the sky down to boiling subterranean lava. The level is randomly generated as an island, restricted by natural boundaries: oceans on the edges, lava beneath it, and the sky above. Other features include day and night and changing weather conditions. The worlds differ in size, humidity, temperature, terrain, and flora and fauna. Abandoned halls and rooms with treasure are hidden somewhere deep within the islands. 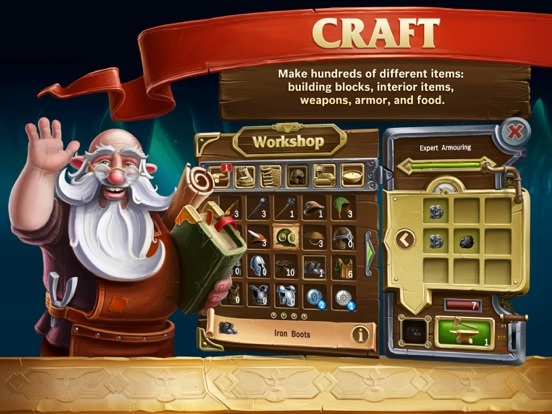 CRAFTING One feature of the game is a user-friendly system of recipes for crafting. The recipes are organized and easily accessible. You can craft dozens of different items: building blocks for houses, furniture, decorations, weapons, armor, ammunition, and food for your dwarves. RTS At the outset you find the recipes for basic tools and items, and build a small house with places to sleep and eat. Then, the size of the tribe increases and catches the attention of other inhabitants of the world. Most of them are night creatures and dwell underground. The worlds are full of fantasy creatures like zombies, skeletons, goblins, beholders, ghosts, giant spiders, and others. Some of them pay little attention to the dwarves, as long as the dwarves do not come into their field of vision. Others gather into quite large groups and try to break into the dwarves’ residence. 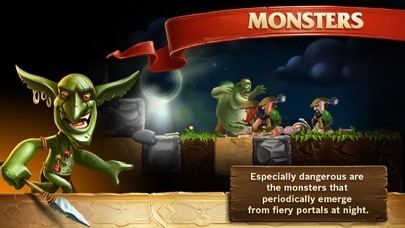 TOWER DEFENSE Especially dangerous are the waves of monsters that appear from time to time from portals. So, do not neglect to build a safe haven with strong walls and numerous trapdoors, cells, firing towers, and secret passageways. 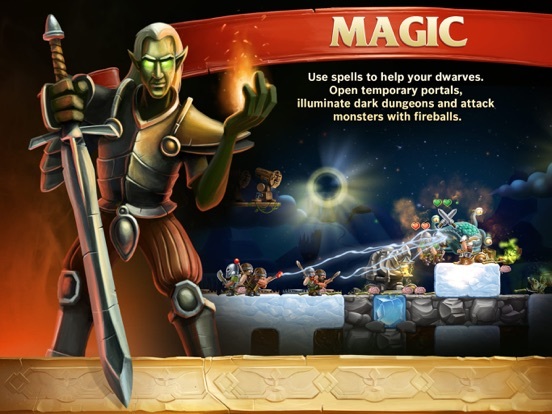 MAGIC As a divine being, you possess various spells. 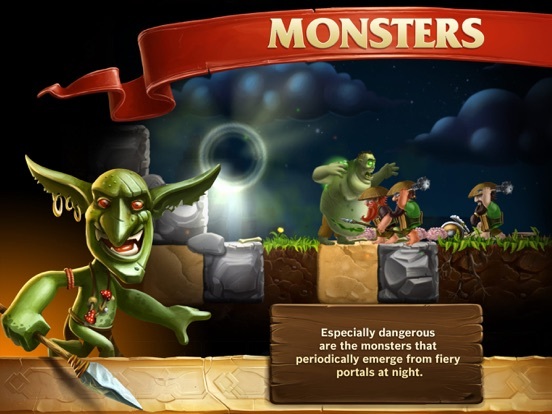 You can speed up the movement of the dwarves, open small portals, illuminate dark caves to scare away monsters, evoke natural magic in the form of rain or tree growth, hurl fireballs at the monsters’ heads, and find useful resources and hidden rooms underground, thereby helping to speed up resource extraction, exploration of the world, and the population growth of your assistants. Pipipitchu, I saw the review on the TA page so I grabbed the Steam version earlier this morning and I can't stop playing until tonight (it's almost 1 a.m.), it's just awesome! I just checked my wishlist on the App Store (I put this game on it this morning as well) and it's on sale, it's like christmas morning, what can I say? 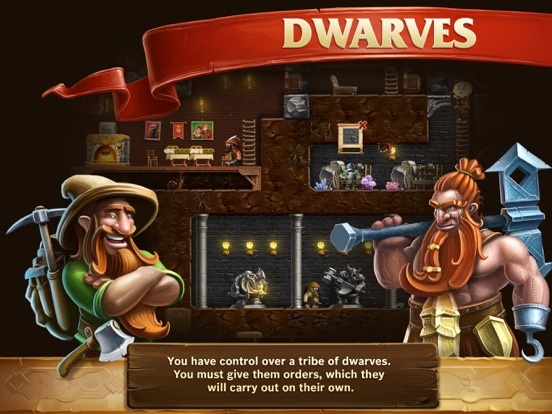 I just bought it for iOS as well, it's incredibly polished and those dwarves are just supercute and beautifly dumb, you just have to love 'em If you're still on the fence, I guarantee it's worth the money. But the choice is yours of course. I'm just saying, highly recommended! I'm a professional when it comes to living. How about a,"Would if I could" option. Still looks good also. Damn.. I read it wrong and hit the wrong option, seems I can't change it. Well, I'll watch a gameplay tomorrow with open heart. This is highly recommended if you like a good mix of Terraria and Dwarf Fortress. damn I wish you hadnt said that. I *love* terraria. I wouldn't even class this as a sale, it launched at less than this and then they upped the price twice and only lowered it once. Im probably in the minority to say i generally have no interest in these types of games. Bought Terraria and that other one but never played each one more than an hour. It launched at less because it was launch sale and you know that. I encourage the developers to do that, it feels right and probably the best way to get noticed and recognized. I bought Terraria as well and didn't play even an hour, it's just not my cup of tea. On the other hand I really like Minecraft and spent quite some time with it. But I love dwarves, who doesn't? 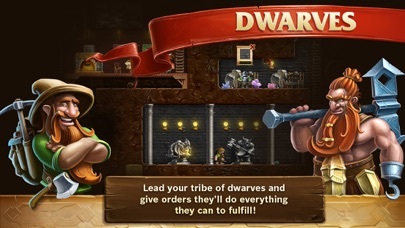 The art and visuals in this game are amazing, those dwarves are just supercute. Every one of them is different with various faces and clothes, job titles and skills, but when they're running towards the enemy with their clubs or daggers, you just have to love 'em. I already spent hours in this game and I'm not planning to stop anytime soon. It's not a sandbox in the proper sense of the word because the difficulty is constantly increasing with each wave of enemies and you're forced to learn and craft new items and improve your shelter along with taking care of the food and whatnot. It's a unique combination of multiple game genres. 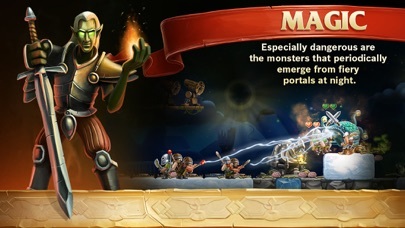 There are aspects of tower defense, sandbox, building and managing. With its current sale price it's a no-brainer. Highly polished game with hours and hours of fun guaranteed, premium content and no IAP and most of all, smooth touch controls. I don't need to oversell this game, the reviews speaks for itself. I just highly recommend it, that's all. BECAUSE, if a premium title comes along, people need to buy it to show developers that there is money to be made on the App store without having to resort to timers and IAP. If you don't have the money, or you're not interested in the game, then don't buy it, but ffs, whatever you do, stop complaining about the price on every thread, you're not helping. BTW, anyone wondering whether it's worth the money, I have 7 hours playing in the first level, and I don't think I'm halfway through unlocking the Tech tree yet. That last part is my personal problem with it. It's too damn slow. I like it, but I have to complete EVERY part of the skill tree to get mythril weapons, so I can complete the level. That's too long. It's too damn slow. I like it, but I have to complete EVERY part of the skill tree to get mythril weapons, so I can complete the level. That's too long. whatever you do, stop complaining about the price on every thread, you're not helping. I dont know who youre thinking of, but it isnt me. *edit* Furthermore, there is a flippin poll on this thread on the subject. If you dont want people commenting on the cost, take it up with the thread creator, not me. So after checking the last page of my recent posts, not only do I see no complaints about pricing, but I see more than one instance where I indicated I am okay with premium pricing. So... yup really not sure where you are coming from but it kinda irritated me. Yeah, but why would you bother to vote in a poll or post in the thread about the game you're not interested in? I'm curious about the opinions of those who actually are interested, that's the point of the poll.